Established in July 18, 1917, Camp Logan was the station of 3rd Battalion, 24th Infantry the night of their insurrection. 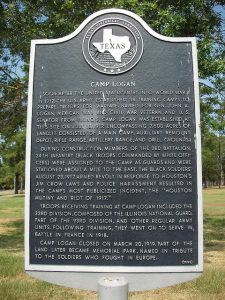 This historical marker stands in Houston’s Memorial Park, where the camp was located. Few of Houston’s residents today realize that during World War I Houston had a military base just west of downtown. 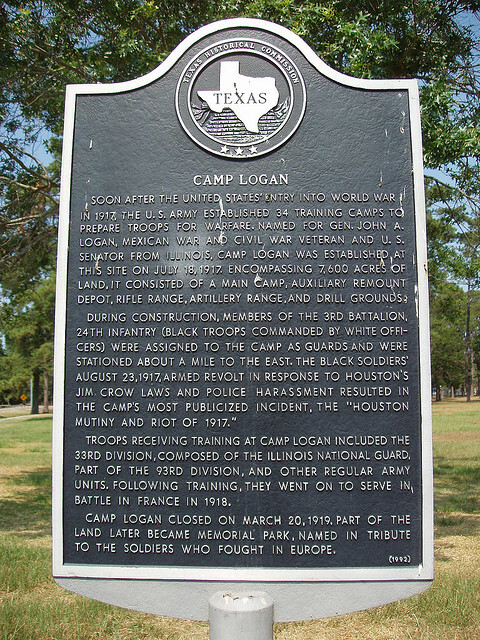 Camp Logan, one of sixteen auxiliary military training camps established during the era, sprawled across much of the area that is now Memorial Park, south from Washington Avenue and across the bayou from River Oaks. The camp housed and trained over 30,000 soldiers, who lived in neatly organized tents amongst the then scattered trees on the grounds. 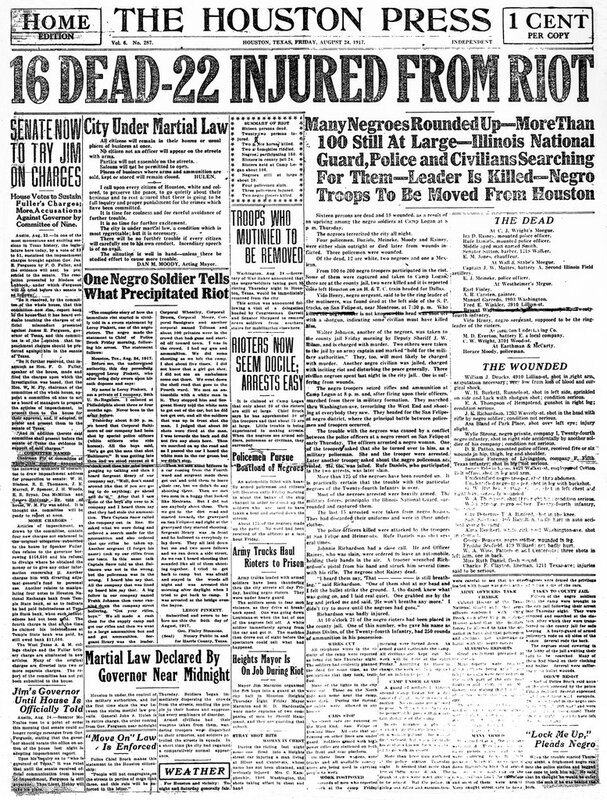 On the night of August 23, 1917, African-American soldiers from Camp Logan incited by police violence earlier that day, armed themselves and marched into town in the only race riot in American history that saw more white casualties than black. 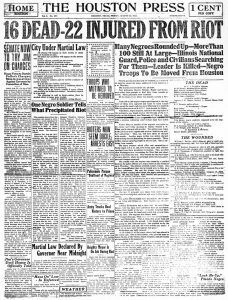 The Houston Press documents the shock that accompanied the “mutiny,” the morning after the riot. Business leaders expected the Houston economy to grow rapidly with the arrival of the military. The Houston-based American Construction Company received the contract to build the camp at a cost near one million dollars a month, according to newspaper reports at the time. Further, citizens expected the camp to generate $60,000 a week for the local economy. Knowing soldiers on leave would enter the city to spend their hard earned pay, residents welcomed the coming military installation. Although the Chamber of Commerce assured the Army that racial tensions would not be a problem if it sent black troops to Houston, the chamber members failed to account for an unprofessional police force and culturally condoned bigotry. The socioracial context in which the majority African-American infantry arrived invited tensions between the soldiers and a notoriously racist police force. In the video above, article author Matthew Crow describes the events before, during, and after the Camp Logan Riot of 1917. Aaron Goffney gives an account of the riot, the trials that followed, and it’s effects on the city nearly 100 years later.